The Datacard SP25 Plus card printer makes it easy to produce attractive cards with high-quality, full-color or single-color photos, graphics and text. Advanced Imaging Technology™ helps ensure bold, vivid color, precise bar code printing and sharp fine-line details. 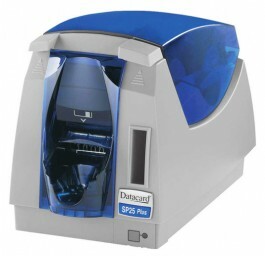 The Datacard® SP25 Plus card printer offers both full-color/monochrome card printing and innovative rewritable card technology in a flexible, dual-function design. This unique, affordable printer is an ideal solution for low-volume applications or requirements. Rewritable cards feature a clear, heat-sensitive layer that can be erased and rewritten over 500 times. The Datacard® SP25 Plus comes with a 2 year printer warranty ! With diverse functionality, outstanding print quality and exceptional ease of use, this flexible card printer is ideal for low-volume applications.